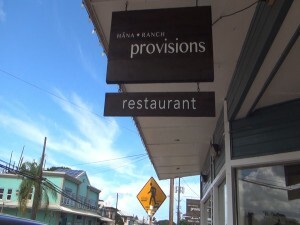 Hāna Ranch Provisions sign on Baldwin Avenue in Pāʻia. Photo by Kiaora Bohlool. After being closed for several months, Hāna Ranch Provisions has confirmed it will not be reopening in 2017. Hāna Ranch opened Hāna Ranch Provisions in Pā‘ia in August of 2015 as a way to bring a true farm-to-table venue to Maui and share the story of Hāna Ranch. But Hāna Ranch Provisions was forced to abruptly stop service in late September of 2016 due to building structural issues. In 2016, Hāna Ranch Provisions won an ‘Ilima Award for Best Restaurant on a Neighboring Island and a Reader’s Choice Award for Best Farm-to-Table Restaurant. Provisions’ food and dining experience received accolades from publications like The New York Times, Vogue, Food Network, The San Francisco Chronicle, Thrillist and numerous local media outlets. Hana Ranch food truck and farm stand. Courtesy photo. 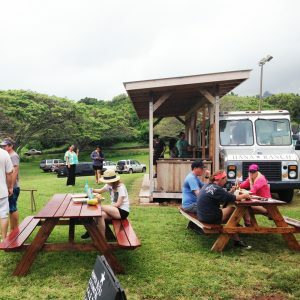 Hāna Ranch has partnered with Maui Preserved in Haiku to rent commercial kitchen space to continue to operate their Hāna Burger Food Truck, located at their ranch in Hāna. Hāna Ranch is a working cattle ranch on 3,600 acres on Maui’s East side. Its goal is to be not only a sustainable business, but a regenerative one, actively working to make the land and our community better each day. Learn more at the Hāna Ranch website .